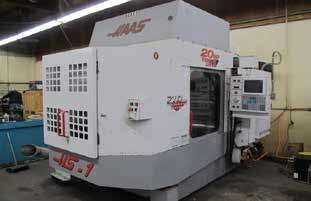 1998 Haas HS-1 4-Axis 2-Pallet CNC Horizontal Machining Center s/n 50429 w/ Haas Controls, 24-Station ATC, CAT-40 Taper Spindle, 7500 RPM, 4 th Axis Thru Pallets, (2) 16” x 16” Pallets, 1mb Expanded Memory, Rigid Tapping, Coordinate Rotation and Scaling, Macros, Chip Auger, Haas Vector Spindle Drive, Hand Wheel, Floppy Disc, 208/230 Volt, Coolant. Dianichi F25 CNC Turning Center 25X600 s/n 29660 w/ Fanuc Series 0-T Controls, 10-Station Turret, Tailstock, Parts Catcher, 10” 3-Jaw Power Chuck, Turbo Chip Conveyor, Coolant. Cadillac mdl. 1733 17” x 33” Geared Head Gap Bed Lathe s/n 058887 w/ 32-1800 RPM, Inch Threading, Tailstock, Steady Rest, Trava-Dial, KDK Tool Post, 5C Collet Closer, 9” 3-Jaw Chuck. AFM mdl. TUE40 17” x 64” Geared Head Lathe w/ 45-1000 RPM, Inch/mm Threading, Tailstock, 9” 3-Jaw Chuck, 10” 4-Jaw Chuck. Osama mdl. 850G 14” x 36” Geared Head Gap Bed Lathe s/n 79435 w/ 60-1800 RPM, Inch/mm Threading, Tailstock, Trava-Dial, KDK Tool Post, 8” 3-Jaw Chuck. Sharp First mdl. LC-1 ½ VH Vertical Mill s/n 7191865 w/ DRO II-2ML DRO, 3Hp Motor, 60-4500 Dial Change RPM, Chrome Ways, 9” x 42” Table. Bridgeport Series II Special Vertical Mill w/ 2Hp Motor, 60-4200 Dial Change RPM, Chrome Box Ways, Power Feed, Trava-Dial, 11” x 58” Table. Bridgeport Series 1 – 2Hp Vertical Mill s/n 186340 w/ 60-4200 Dial Change RPM, Power Feed, 9” x 42”Table. Bridgeport Vertical Mill s/n 153231 w/ 1Hp Motor, 80-2720 RPM, Chrome Ways, Power Feed, 9” x 42”Table. Deckel mdl. FP-1 Horizontal Mill s/n 35821 w/ 60-1200 RPM, 8” x 23 ¾” Table. 2009 Kent SGS-1230 AHD 12” x 30” Automatic Hydraulic Surface Grinder s/n 98054 w/ Kent Controls, Automatic Cycles, Wheel Dresser, Kanetsu Electromagnetic Chuck, Coolant and Filtration System. Paragon GUS32X50 Universal Grinder s/n 6320050061 w/ Motorized Work Head with 9” Magnetic Chuck, OD and ID Grinding Heads, Hydraulic Feeds, Tailstock, Steady Rest, Coolant and Magnetic Particulate Separation. Hartex 13” Cylindrical Grinder s/n 601/274 w/ Motorized Work Head, 26-600 RPM, Power Feeds, 14” Grinding Wheel Cap, Coolant. Landis 10” x 20” Universal Grinder s/n 365-18 w/ Motorized Work Head, OD and ID Grinding Heads, Tailstock, Coolant. Webb 6” x 18” Surface Grinder s/n 73084 w/ Magnetic Chuck. Bridgeport 8” x 15” Automatic Surface Grinder w/ Ceramax Magnetic Chuck, Coolant. Charmilles Eleroda 400 Die Sinker EDM Machine s/n 4266 w/ Charmilles Isopulse EP3 Controls, Acu-Rite II DRO, 14” x 24” Table Area, 5” x 10” Magnetic Chuck, 9” x 15 ¾” Ram Area, Coolant and Filtration System. Sodick FS-A3B Die Sinker EDM Machine s/n SA3B-318 w/ Sodick 8100 Controls, System 3R Tooling System, 9 ½” x 17 5/8” Table, 6” x 12” Magnetic Chuck, Fire Suppression System, Coolant and Filtration System. W.F. Wells mdl. W-9 9” Horizontal Band Saw w/ Manual Clamping, Conveyor, Coolant. Boice Crane mdl. S53-L Geared Head Drill Press s/n 20352 w/ 120-1645 rpm, 8-Speeds, 17” x 22” Table. Burgmaster 6-Station Turret Drill Press s/n ID4994 w/ 12” x 17” Table. Trinco mdl. 36/BP Dry Blast Cabinet s/n 71214-12 w/ Dust Collector. Husky 4Hp Vertical Air Compressor w/ 2-Stage Pump, 80 Gallon Tank. Arctic Refrigeration Co mdl. AC6 Chiller Unit s/n 64128. Central Hydraulics 12-Ton Hydraulic H-Frame Press. Nikken 12” Compound Rotary Table. Scherr Tumico 14” Floor Model Optical Comparator. 24” x 36” x 4” Granite Surface Plate w/ Stand. Standridge 18” x 24” x 3” Granite Surface Plate. Yale GLC030CENUAE083 3000 Lb Cap LPG Forklift s/n N512191 w/ 3-Stage Mast, 190” Lift Height, Side-Shift, Cushion Tires. Portable A-Frame Gantry w/ Yale 3-Ton Electric Hoist. Economy 750 Lb Cap Die Lift Cart. BUX mdl. CM-3 2000 Lb Cap Lifting Magnet. 5’ x 8’ Steel Die Table.